Back injuries are common in virtually every occupation and every walk of life. From students to nurses, construction workers to lawyers, body builders to computer programmers, high school kids to the elderly, back injury doesn’t discriminate, and its effects can be debilitating. Even a somewhat minor back injury can take you out of work, out of your exercise routine or make it extremely difficult to sleep at night. MMAR Medical provides numerous back braces and support in the event of an accident. But what proactive steps can you take to prevent yourself from ever having to suffer through a back injury ordeal? Read on for our back injury prevention strategies to keep your spine healthy and your life on track. Core muscles are crucial to providing support for the lower back and avoiding injury. Try adding a few core exercises to your daily routine. Planks are a great option as they work your abdominals and your obliques, giving you solid support on the front and sides of your body. To do a plank correctly, place your palms or forearms on the ground at shoulder-width distance. Keep your shoulders above your wrists and step back to bring your body into a straight line, from the tip of your head all the way to your heels. Hold for 60 seconds. Never let your hips collapse out of the straight line. This will only strain your lower back and open you up to injury. When you’re done, bring your knees to the ground carefully. 2. …And that heart, too. Low-impact aerobic exercise increases blood flow to the spine, which promotes healing and hydration to all of your vertebrae. Briskly walking your dog, light jogging, using an elliptical, riding a bike or swimming all count as low impact aerobic exercise. Doing any of these activities 3-4 times per week will benefit and protect your spine as well as your overall health. Bad posture can have lots of negative effects on your body. 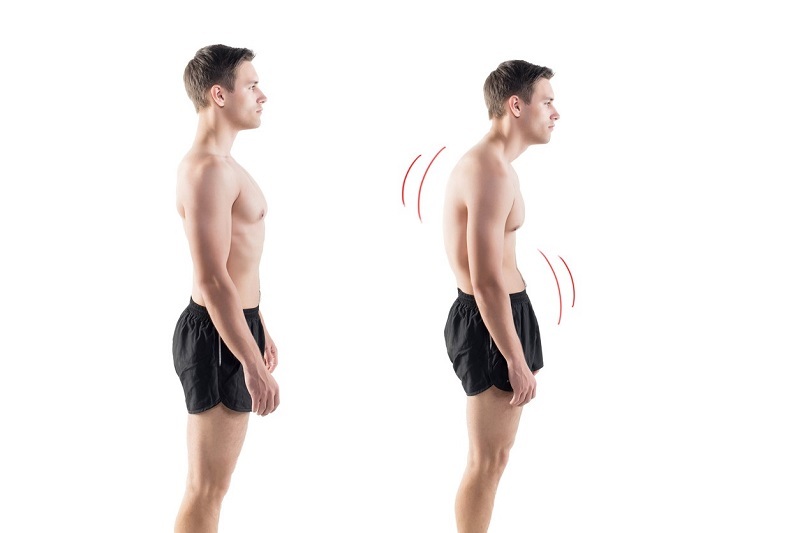 In the short term, poor posture causes pain and discomfort from unnecessary pressure on the vertebrae. In the long term, sustained use of poor posture can cause muscle and tissue damage. Practicing good posture while walking and sitting up straight at your desk can help prevent these injuries – and it also works your core. To find your natural posture, stand with your back up against a wall and your heels about 2-4 inches away from the wall. Notice how your body creates a straight line, from the crown of your head down through your pelvis. To maintain this stance without a wall, focus on keeping your abdominals pulled in and your shoulders relaxed back. It might feel strange at first, but with practice, good posture will become second nature in no time. A little known cause of back pain, especially in the lower back, is extremely tight hamstrings. If you’re experiencing back pain and can’t remember the last time you stretched, try some gentle hamstring stretches, like reaching for your toes or propping your leg up on a chair. If you already have a diagnosed back injury, use special caution here – not all stretches are good for all back conditions. Always check with your doctor or physical therapist before starting a new regimen. Unfortunately, a very common cause of back injury is automobile accidents. Driving carefully is smart, courteous and can help you avoid months of pain and discomfort from a back injury. Make sure to always leave yourself enough travel time to avoid reckless driving, and if you’re guilty of serious road rage, try listening to some soothing music while you’re on the road. You’ll save your back and reduce overall stress! 6. Lift with your legs. Heavy lifting is a classic cause of back injury. But when you’re moving, you’ve got not-so-small children or your job requires it (looking at you, maintenance and construction workers), lifting heavy items is unavoidable. If you’re caught in one of these situations, squat down, grab the item, engage your core, and stand up. By concentrating the pressure in your legs and not your lower back (“lifting with your legs”), you’ll avoid back injury, and carve out some killer buns & thighs too. Back injury isn’t completely unavoidable. But following these tips and doing these lower back exercises will help you take preventative action by keeping your back strong and healthy. For more information on back pain, back injuries, back care and answers to questions like “How do I shower with a back brace?” take a look at the back injury page of our website. We hope you never endure a back injury; but if you do, MMAR Medical is here to help you along the road to recovery.